I was pretty busy today. I left for Rosemont at 7:45 and felt pretty energetic. 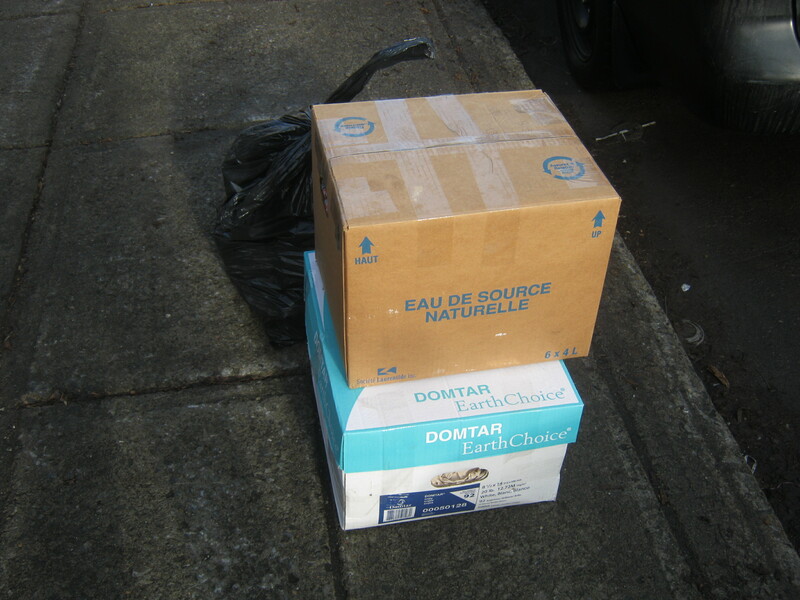 I ended up discovering that trash day extended much further East than I thought. 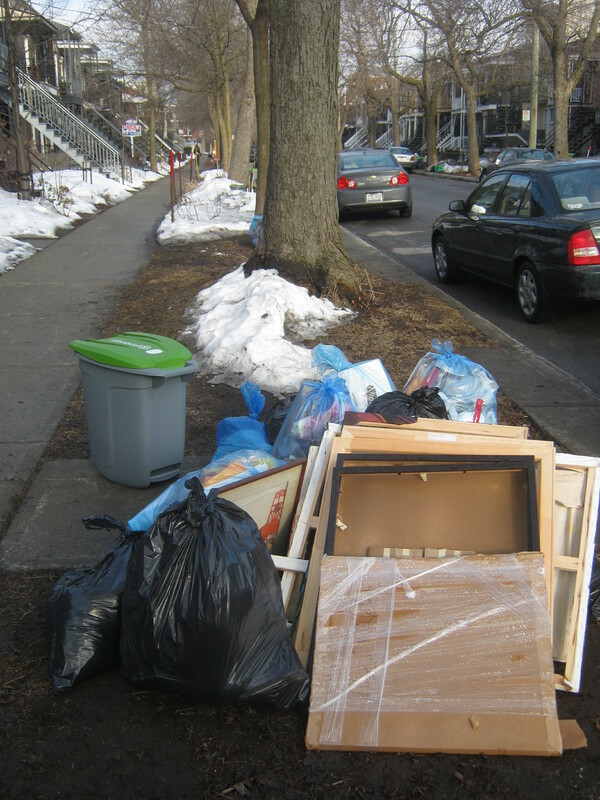 I explored a bit and ended up at rue St. Michel, which is the furthest East I’ve ever gone for trash. I got home around 11:30, which meant I was out for close to four hours. I went the police station to get more information regarding my jewelry and made it out for a run through the Plateau / Mile-End. Overall I didn’t find anything that’ll blow your socks off but I definitely salvaged a bunch of good stuff and got a lot of exercise to boot. The first thing I came across were two of those comfortable portable chairs. I brought them with me and put them in a donation box. 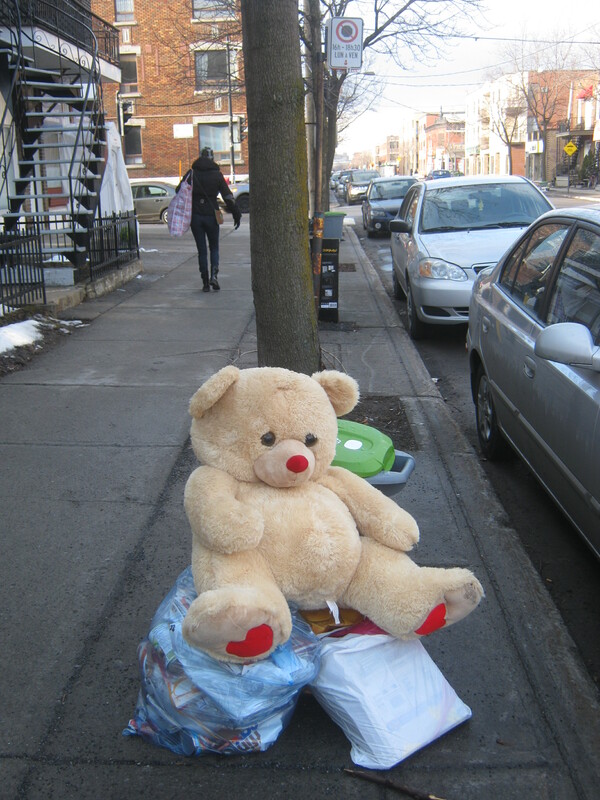 I came across this sad looking teddy bear on St Zotique. I was about to leave it behind, but was feeling kind of sentimental (maybe because it looked so sad!). It was too big to bring with me even for a short time, so I brought it into the alley and placed it where someone else finds might find it. I found this painting in the pile above. I was about to leave it but decided to bring it home. I’m a sucker for hand-painted art and I appreciated the artist’s style. I’m not sure what the men are building though… any ideas? It was a bit dirty under the glass but I was able to clean it up. I think I’ll replace the cardboard border. Inside these boxes (sealed boxes are always worth checking!) I recovered some playing cards, a book about pendulums (with an attached pendulum), and a kids’s life-jacket (that looked to be in good condition). There were also a lot of bottles that were likely used for wine-making. I deposited the life jacket in another charity box. 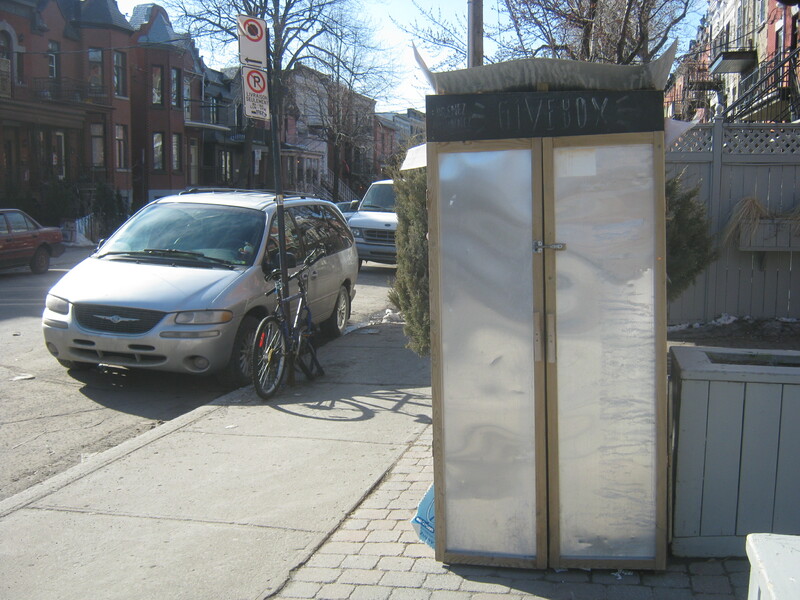 Rosemont seems to have more charity boxes than the other neighbourhoods I go to, which is convenient. 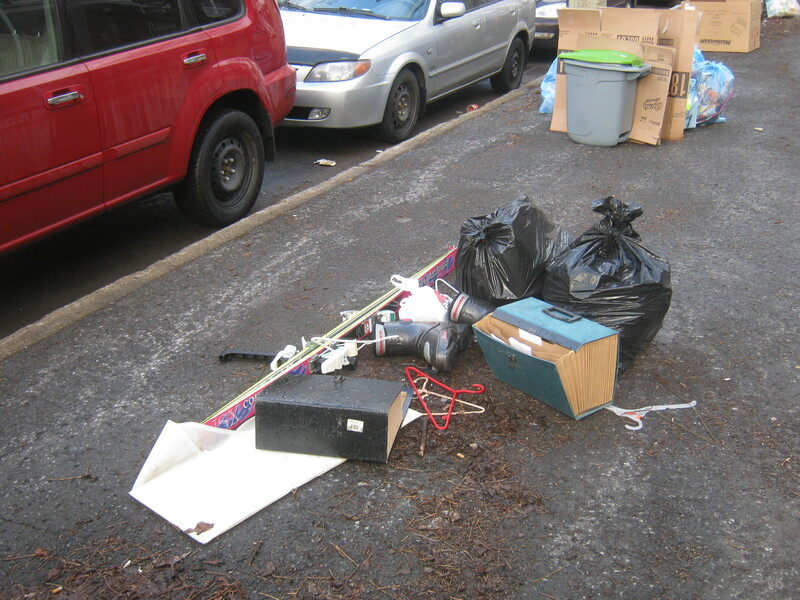 This haphazardly-placed trash contained some tools, screws and other hardware-related things. There was a plastic bag full of forks and knives as well. That’s not too exciting, but three of them were nice old silver plate (“Revelation”) forks. I love silver cutlery and happily added them to my collection. 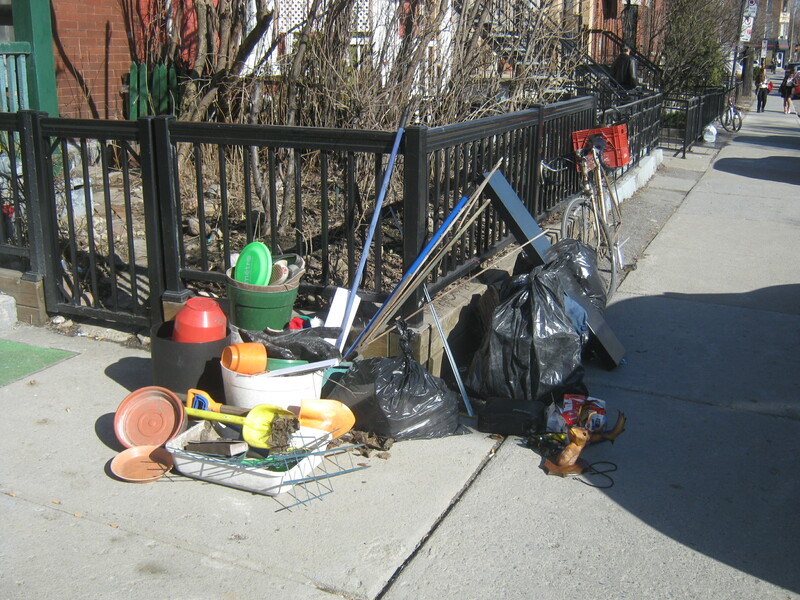 I dropped off the tools, fuels, forks, knives and whatever at the “Give Box” on St Viateur. These are boxes built around the city where people can leave things they want to give away. More of these pop up when the summer comes and I’ll definitely put them to good use. They give me a place to put stuff I don’t need but also don’t want to go to waste. I came across this garbage a little before I arrived at the Give Box. 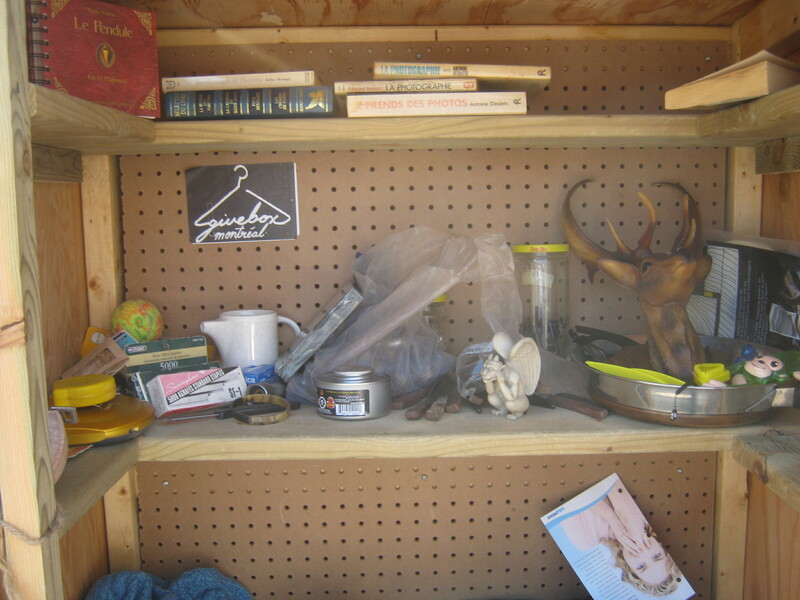 I dropped off a few things at the Give Box, but took some home. Inside these bags were six toners for printers. 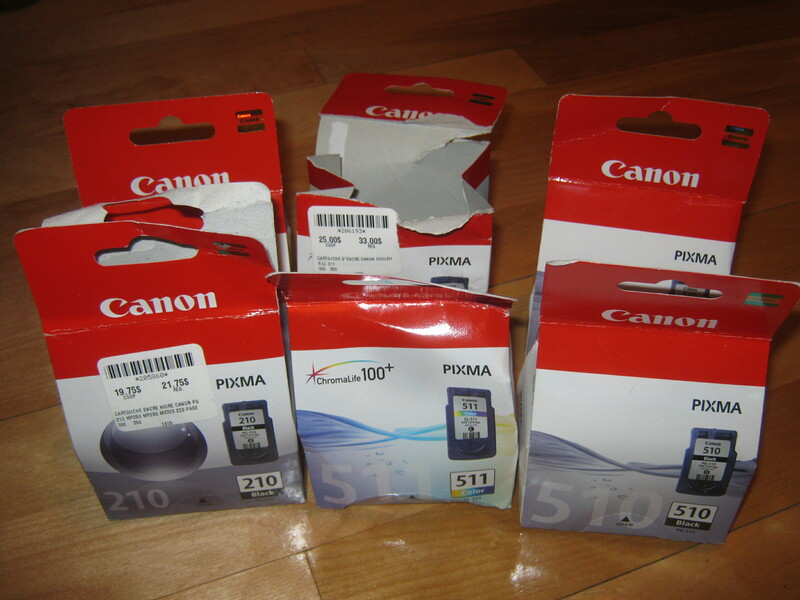 Some of the boxes were open, but all the toners looks to be unused. Toner is expensive and I’d say I found maybe 100$ worth of it here. 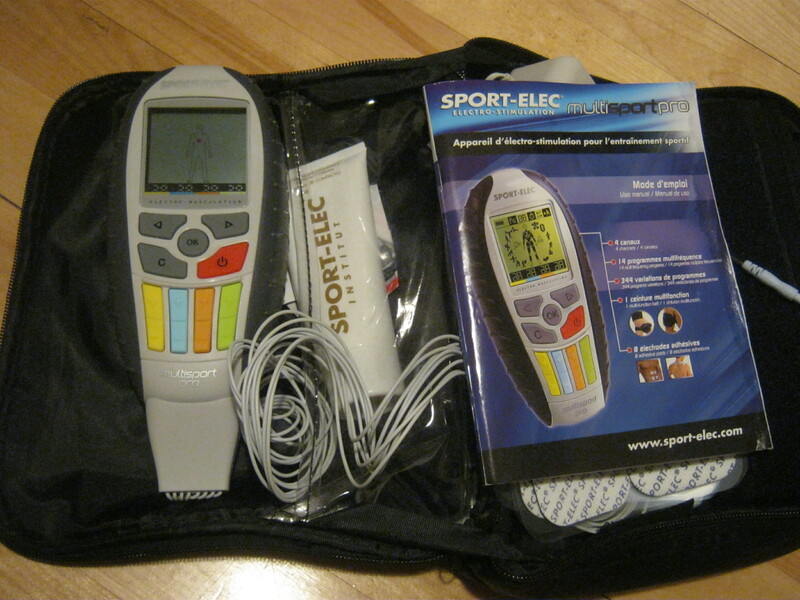 I also found this strange “Sport-Elec” device. It looks like something for stimulating muscles with electricity? I don’t really understand. It looks pretty much unused, despite a receipt inside that said it was bought for about 200 Euros. The charger was European, so it was definitely from overseas. I’m not sure what I’ll do with this thing – it seems like it could be worth money if it works, but it’s also sort of a weird thing to sell and I’d have to find a converter to test it with. 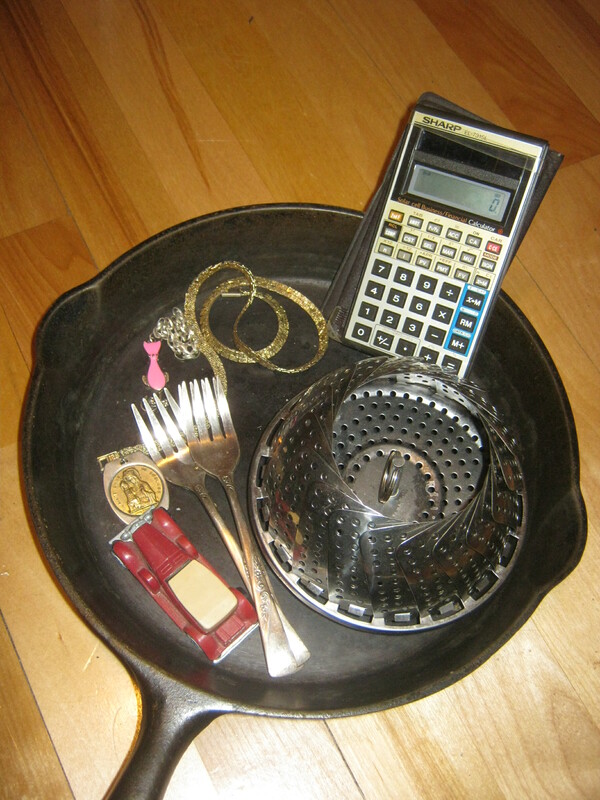 These were the fruits of my run to Rosemont / St Michel: silver forks, a medallion, a calculator, something for steaming veggies, a sterling silver bracelet I found near the flea market, and a little toy car, all inside a cast iron pot that I’ve promised to a friend. I’ll probably end up keeping only the silver and the veggie steamer. 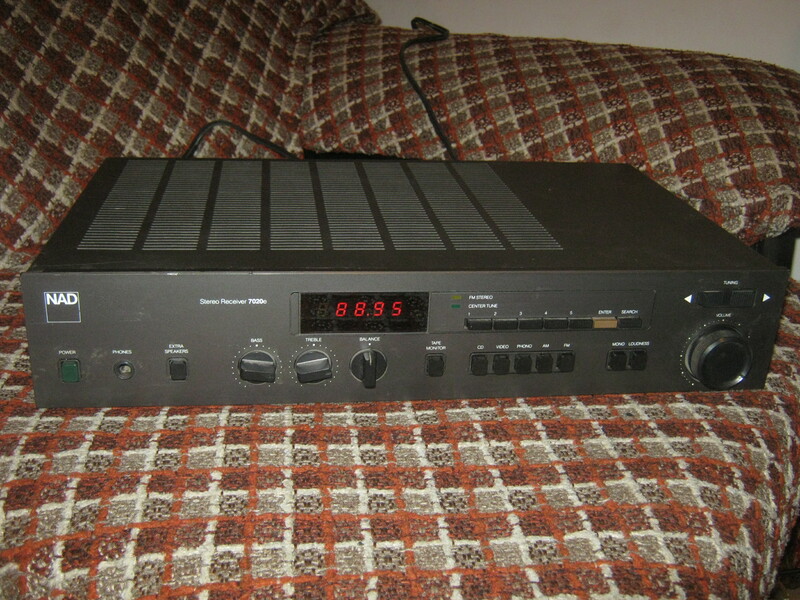 I found this stereo receiver later in the day. It worked at first, but when I came back to it later it no longer wanted to turn on. I may have blew a fuse or something. I’ll take a look inside later to see what’s the matter. I was hoping it would work, as it’s a useful for tested other audio equipment I might find. Also, if it does work it sells for about 100$ on Ebay. Regarding the jewelry: I went to the police station and they gave me a number to call in one month to see how the (investigation?) is going. However, the officers didn’t seem to be very optimistic about the likelihood of me getting the jewelry back. A consistent theme I’ve noticed is that the police seem confused about who actually owns garbage. The original officers were pretty bewildered and the ones I talked to today seemed to believe that I am not the actual “owner” of the garbage. However, why am I not? If I don’t, who does own them? Interesting questions, and I’m going to try to figure out the best course of action in the coming days. 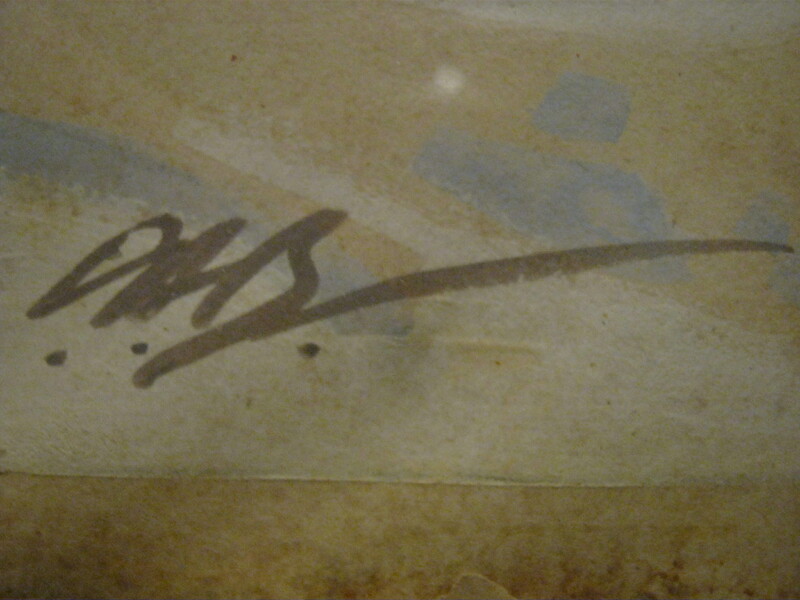 Here’s a picture of the artist’s signature for those who are curious! It’s hard to make out. Very interesting situation with the police and the matter of who “owns” the garbage. 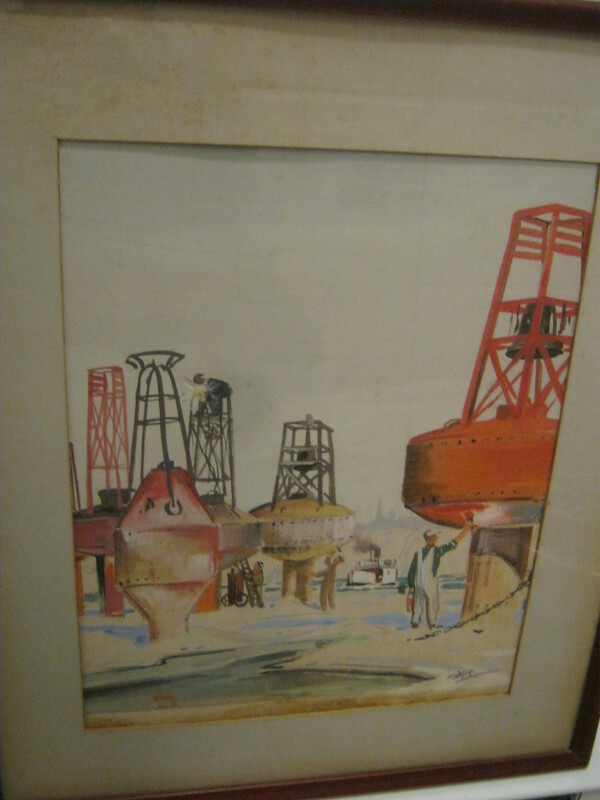 The hand painted picture is really good and the objects being painted are buoys for ocean navigation. They float at the end of a chain anchored to the ocean floor and some have bells at the top so they sound in rough or foggy seas. Can you identify the artist? I like the painting. I was going to ask if you could make out the artist’s name too. The guy in the white overalls reminds me of my dad, who was a house (or whatever needed painting) painter. He always wore white overalls and a white paint cap when out on the job. I lobe those Give Boxes … what a great idea! I’m curious re: that book about pendulums (with the attached pendulum) … a kid’s book, I presume? I posted a picture of the signature at the end of the post. What do you think it could read? I can’t really make it out. I’m not sure about the book. I didn’t look at it too long. 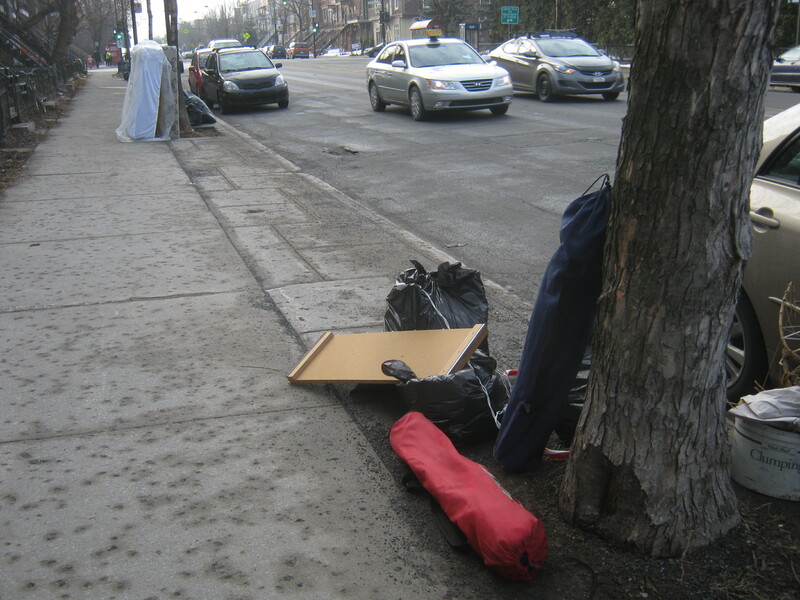 It is not wrong to take stuff off the curb if the person has thrown it out deliberately and wants it to be salvaged by someone.But that poor old lady’s belongings were thrown out under suspicious circircumstances by shady people or incompetent people.What you found in Rosemont does not make me upset;but I cried when I saw the garbage pile of that old lady’s belongings in your last posting.Forgive me!